Milos Dimitrijevic, of Sydney FC, cools down as a drinks break is taken during the round seven A-League match at nib Stadium. Photo: Paul Kane/Getty Images. WHEN will the A-League learn? Football is not a game that can and should be played in high temperatures. That is why you end up with non-spectacles such as the 0-0 draw between Perth Glory and Sydney FC and that is why, if the powers that be are not careful, we could have a death on our hands at an A-League game. Of course, the players at that level are fit athletes. But no one should be forced to play in a game when the temperature is 34 degrees no matter what the rules of the competition states. 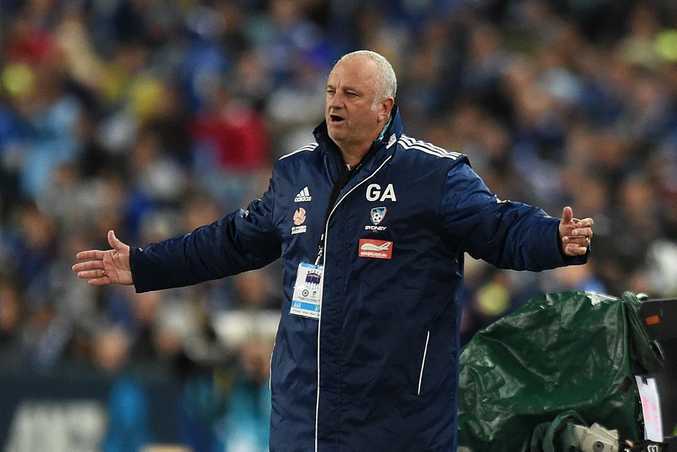 Sydney FC coach Graham Arnold got hot under the collar himself about Football Federation Australia's heat policy and I don't blame him. The game kicked off at 4.30pm in Perth with the heat still a huge factor. The A-League uses the Wet Bulb Globe Temperature as its guide to see if matches should take place. The WBGT takes into account the air temperature, humidity, wind, and radiation to provide a more accurate indicator of the risk of heat-related injuries. But Arnold was not happy with that and I can't blame him. Pushing back kick off a couple of hours would have suited everyone, even the fans, who I am sure would not like to stand and watch in the blazing heat with not much cover for 90 minutes. "Does it need someone to die first?" Arnold said when asked about the heat. "Yeah, the wet bulb is saying (it's ok). But at the end of the day, it's roasting hot, and the players can't run. "They were buggered. If you go and ask those 22 players if they enjoyed today's game, I think you'll find 22 players will say, 'I would have rather have been at the beach'. "You may as well throw all tactics out the door. "It's a matter of just hoping the players can just get through the game - with no injuries, without dying, and without making mistakes." I, like Arnold, am not calling for a change to the WBGT but common sense has to prevail in these situations. I understand that TV scheduling plays a big part in these decisions but even a kick-off at 6.30pm local time in the west is only 8.30pm in most other states. Playing in that heat will end up with a death.